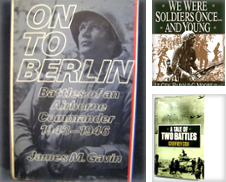 Kisselburg Military Books - AbeBooks - Potomac, MD, U.S.A.
12,000 titles in rare and out-of-print military history. We specialize in books on World War II. Foremost dealer in books on the Second World War in North America. Please contact us if you have military history books to sell. Postage is $3.50 for USPS bookrate. Priority Mail is $14.00. Foreign postage is extra.